Janet is forbidden from visiting the woods near her father's castle because legend says that long ago a local boy called Tam Linn was stolen there by the fairy queen and never returned. But Janet isn't afraid of fairy stories...Deep in the woods, by a well, she meets a fairy knight - the famous Tam Linn, forbidden to leave by the evil queen's spell. Janet decides to save her new friend, but when the queen and her army appear, fairy magic turns Tam into a whole host of Scottish creatures. Can Janet hold on long enough to rescue him? A sharp and intelligent retelling of the traditional Scottish fairy tale of Tam Linn, which originated in the Scottish Borders, adapted for a young audience. Award-winning author Lari Don's fresh take on this well-known story is perfectly complimented by artist Philip Longson's breathtaking illustrations. 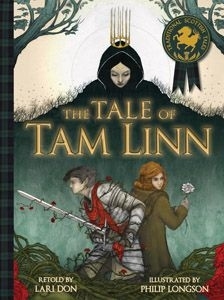 The Tale of Tam Linn is one of the first titles released in the new Picture Kelpies.